Southern Spain’s opulent, broad-gauge Al-Andalus returned to the rails May, 2012, with its 1920s-era cars newly renovated. The Al-Andalus includes bar, tea-room and two dining cars, as well as all-en suite cabins. The train combines stellar service, exquisite Art Deco styling and excellent cuisine for a once-in-a-life-time experience. For IRT Society Vice President Angela Walker’s account of her spring, 2012 Al-Andalus adventure, please click here. The Al-Andalus maximum occupancy is 64 people with 30 compartments (20 Deluxe Suites and 10 Grand Class Rooms). Each Grand Class Room (86 square feet; 8 square meters) has two twin lower beds, a safe, a closet and a private bathroom with shower, sink and toilet. One bed is 2.6 feet by 6.2 feet (0.80m x 1.90m); the other bed is 2.3 feet by 5.9 feet (0.70m x 1.80m). Deluxe Suites (108 square feet; 10 square meters) have a double bed, a minibar, safe, closet, and private bathroom with shower, sink and toilet. The double bed is 5 feet by 6.2 feet (1.50m x 1.90m). During the day, the beds in each room can be folded into comfortable couches, offering a space for reading or to enjoy the landscape in a private lounge. All suites are separately air-conditioned. 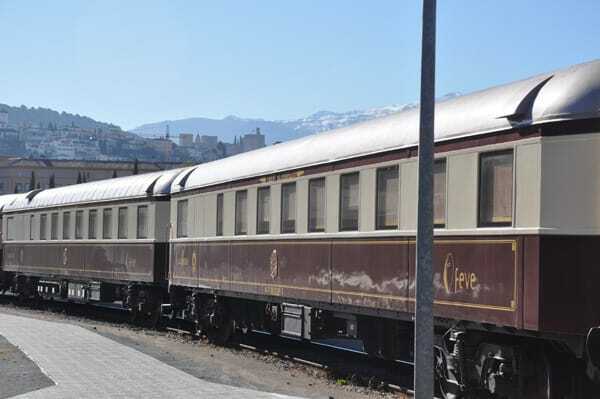 The Al-Andalus has four railway gems: its four lounge/dining cars from 1928 and 1930. These common spaces are devoted to leisure and to the enjoyment of traveling. The two dining cars have tables set for two or four. A buffet breakfast is served daily, and two lunches and dinners are served on board. Service and meals are top-notch, featuring local wine and specialties. The bar car has a dance floor, bar and comfy armchairs. The bar car features live entertainment two nights during the journey. The lounge car, in beautiful light greens and grays, has large couches, tables and chairs. Games and books are provided, and there is a computer with internet connectivity for guest use. All of the cars are air-conditioned and open 24 hours a day, to be used and enjoyed. The entire train is connected, allowing visitors to move freely. Laundry services are available at your own additional cost on certain departures of the train depending on local vendor availability. Passengers board the Al-Andalus. Photo by Angela Walker. Al-Andalus dining car set for lunch on board. Photo by Angela Walker. Enjoy on-board entertainment in the Al-Andalus bar car. Photo by Angela Walker. Al-Andalus superior cabins have a double bed and full bathroom en-suite. Photo by Angela Walker. The staff of the Al-Andalus stands at the ready to serve passengers. Photo by Angela Walker.